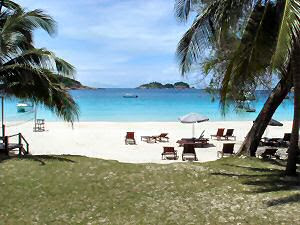 Enjoy lazy beach life at the Coral Redang Island Resort. Just remember that it's rainy season now, so you can get wet. Add to that global warming is adding more ice from the north and south pole into the atmosphere, and you know rain is becoming a major problem. Hence the huge amount of floods this year in Terengganu. Other than that, getting to Redang is not easy. Which is good news for saying: you won't find that many tourists in Redang. The Shahbandar Jetty will take more than an our to reach the main port of Redang, where you need to switch to a smaller water taxi which will take you to Coral Redang Island Resort in about 20 minutes. Note that there is no TV and no coffee maker in the beach chalets, so anything you need you have to find in the restaurant or call for the more than efficient room service. Since the Coral Redang Island Resort is situated within Malaysia's premier marine park sanctuary, do sign up for some snorkeling or diving tours or just relax under the palms trees at the beach.